In case you didn't know, I love textiles! I especially love knits. I even love the "concept" of knits, the idea that so many varieties of knit can be made from a continuous length of spun fiber. On a good day, my time is spent either in the act of making sweater knits or otherwise working with knits in some way -- choosing the yarn, designing a stitch pattern, blocking the fabric or following up with some cutting and sewing. In reality, as most people running their own solo creative businesses know, there is much time spent with administration -- email, phone calls, packing, shipping, bookkeeping, etc. But it's all good. People who aren't familiar with my sweater knit fabrics or machine knitting in general often ask how the fabrics are produced or how my fabrics differ from sweater knits available elsewhere online or at the local fabric shop. I can only speak in general terms about other knits, but I can tell you how my fabrics are made. This is the corner where I knit the fabric. That's a Passap DM80 knitting machine. I'm sure it looks familiar to any machine knitters reading this! 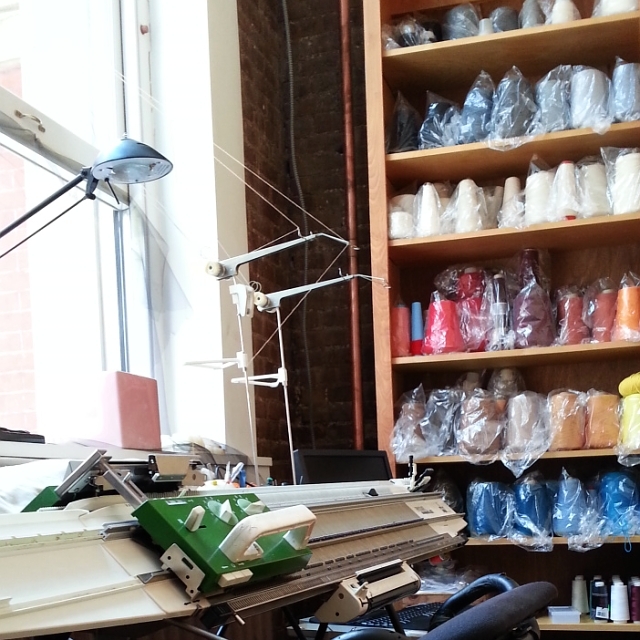 It's considered a v-bed, semi-industrial, hand knitting machine. (Yes, semi-industrial and hand knitting!?) Every time the green carriage is pushed across the needle bed another row is knitted. Though my machine is similar in many ways to machines found in knitting mills, my fabrics will never be as wide as those produced in a knitting mill, because the industrial machines are wider. 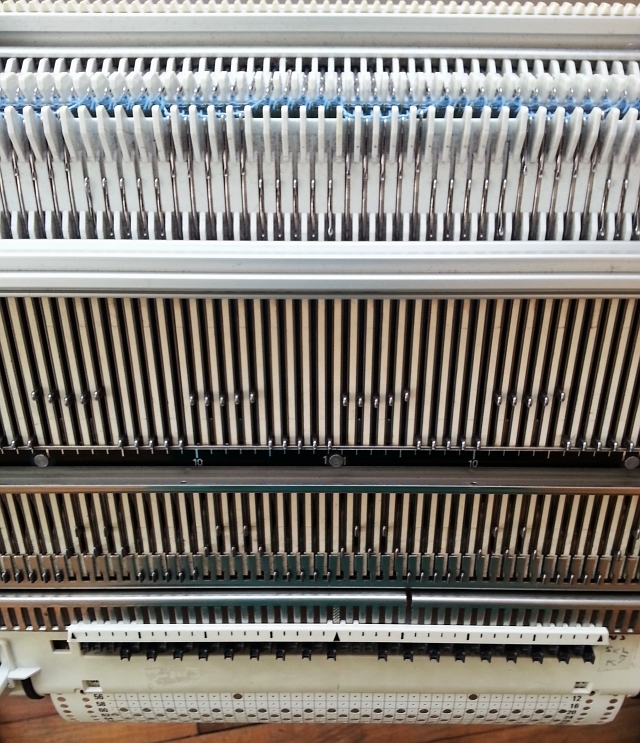 My knitting machine has mechanical needle selection, meaning that every stitch pattern is "programmed" into the machine by way of some mechanical action, either with a punchcard or by directly manipulating clever little sliding metal pieces called pushers. The pushers "remember" the stitch pattern so it's not necessary to enter the pattern for every row. Getting back to the top picture, if you look closely, you can see a computer between the knitting machine and shelves of coned yarn. I make some of my more complex designs using a program called DesignaKnit 8. Though the program can be used for designing garments, I use it to help me visualize a stitch pattern, to quickly do color separations (for multi color knitting), and to give me alerts to change settings or yarn colors for certain types of knitting. I use the program mostly when I'm doing swatches for professional clients. Even though my knitting machine isn't electronic, I have a cable with a sensor that links the computer to the knitting machine to keep track of where I am in the stitch pattern. On the back wall is some of my yarn collection. The quality of the yarn is what makes my fabrics different from much of what is available online and in fabric shops. My merino wool knits are soft and luxurious. 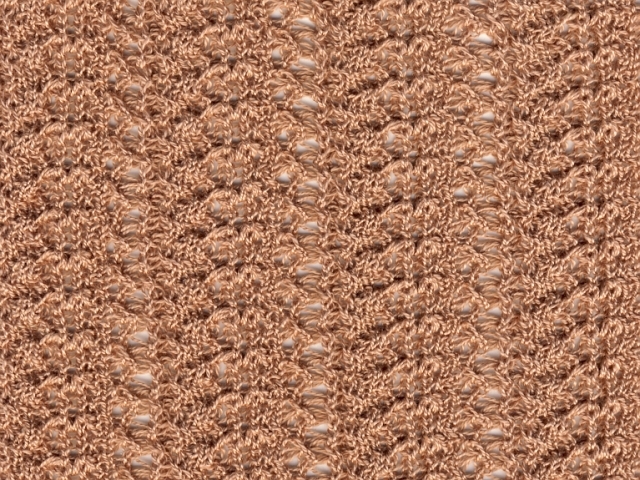 The pearl cotton knits show excellent stitch definition. And my knitted bamboo is silky with a subtle sheen. It's all because of the yarn, some of it the same yarn used in the sweaters from famous designers. When I'm making an original stitch pattern design, as opposed to a standard rib or stripe or houndstooth, the idea often begins with a pattern found somewhere other than in fabric. I try to translate the pattern to knit, knowing full well that it will never look like the original source, but that it's a good place to start. Since I'm inspired by texture, I usually redo the swatch several times, each time doing a variation such as adding extra tuck stitches in order to tweak the texture just a bit and, of course, trying the pattern in different fibers and colors. Other times I'll just do a (relatively) flat color pattern that comes from my imagination or from "playing around" on the knitting machine or computer. I rarely do figurative knits. 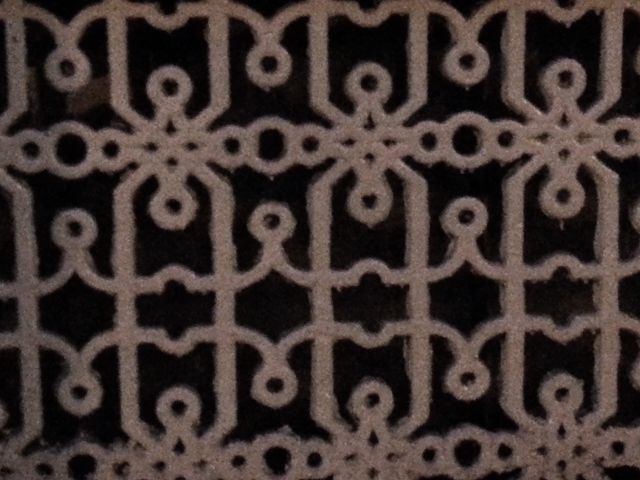 This lacy pattern was inspired by wood floor panels. So that's how the fabric is designed and made. As some of you know, the building I'm in is currently under renovation. Even though my work area is set up now, I'll be temporarily moving my equipment (again) to make way for the installation of new radiators. It's disruptive, but fortunately I'm almost used to working around disruptions now! One bonus of working here is that when the construction platform isn't blocking my view of the street, I have lots of entertainment. I live and work on a popular street for photo and film shoots in Soho, NYC. Click here to see my favorite video capture from last September. You are so right about the quality of the yarn. It's exactly like cooking, great ingredients always make a huge difference! Good luck with the renovations! And thanks, the renovations are not my choosing. I will indeed need luck! Oh I do just adore your fabrics! How interesting to see where you make them! I always hear you running the machine during chat, but I've never been able to figure out how it works. Thanks for sharing. My pleasure! Machine knitters love going on about their machines! I always think I'm going to disturb everyone at virtual craft nite with the sound. It's a little louder that a sewing machine. Also, what are figurative knits?